(SKNIS): Farmers and residents in St. Kitts and Nevis are better equipped to withstand climate change-related impacts such as extreme droughts and flooding due to the implementation of climate-smart technologies. 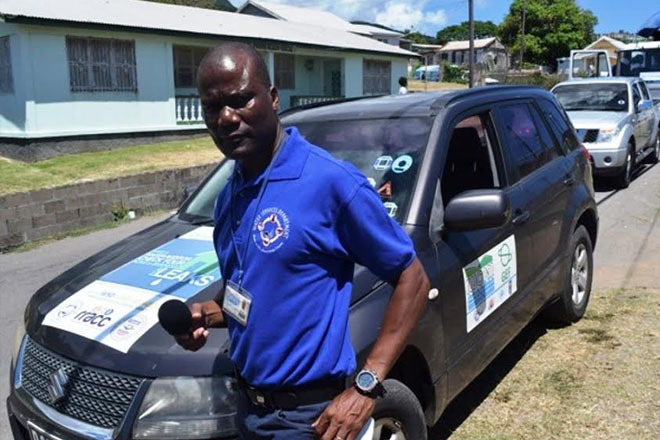 This was achieved under the US$9.5 million “Rallying the Region to Action on Climate Change (RRACC) Project in the Organization of Eastern Caribbean States (OECS). During the official closing ceremony on (May 18) at the St. Paul’s Primary School, for the St. Kitts leg of the RRACC project T. Denison Paul, Acting Manager and Water Engineer at the Water Services Department, said the Department of Environment was tasked with the implementation of the project. The Water Services Department offered technical assistance and the OECS was responsible for oversight. Mr. Paul noted that the project was comprised of several components. These included formulating a water conservation plan; training of local water auditors; the Do Just One Thing Public Awareness Campaign; and the retrofitting of three public institutions with climate-smart tools. The Honourable Ian Patches Liburd, Minister of Public Infrastructure, Post, Urban Development and Transport, said that the government was extremely pleased to facilitate the project and it looks forward to phase two. Laura Griesmer, U.S. Deputy Chief of Mission to Barbados, the Eastern Caribbean and the OECS, said that approximately US$1.4 million in assistance was dedicated to building climate change resilience within the Federation’s water sector. In addition to implementing water-efficient solutions, citizens and residents alike took initiatives to reduce water use, resulting in valuable water savings in 2015. A master drainage plan was developed in Nevis and the island was provided with early warning systems to track floods through the installation of a Flood Early Warning and Data Analysis Station. This included the installation of four flood monitoring stations in vulnerable areas and one central data analysis hub. The programme was funded by the United States Agency for International Development (USAID) and implemented by the OECS Commission.